At the end of the plank, a line is drawn designating the width of the scarph. A second line is drawn two scarph widths from the edge. A spacer board, equal in thickness to the plank (a scrap of plank material will do), is attached flush with the second line. Two screws, countersunk below the surface of the spacer, are driven through the plank and into the work surface, providing a simple and effective attachment. With the back end of the plane resting on the spacer, the plank is planed until a feather edge appears--this yields a scarph with the proper width and slope. Easy to find the joint on the top, but not on the side. Future sailor, Christopher Aragon Leap, poses alongside a major construction milestone--the first plank. 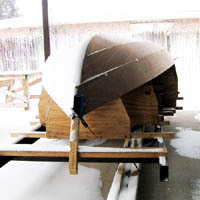 Significant twist in the garboard at the bow is handled easily with several boards. One end of each board is clamped to the backbone. The other end is lashed to the strongback with an adjustable taunt-line hitch. Long lever arms reduce tension in the lines. Two boards are actually used at each position, sandwiching the plank and backbone. The bottom board creates an approximately parallel surface for the lower end of the clamp and protects the backbone. 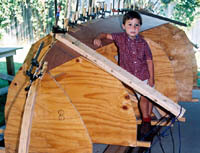 Simpler Garboard #1 Attachment at the Stern. 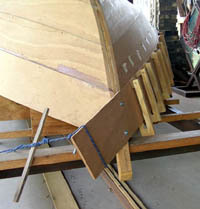 When attaching the second garboard, fewer clamps can be used along the backbone because the first garboard is in the way. Long 2 x 4's lashed at each end hold the planks down at each station mould. 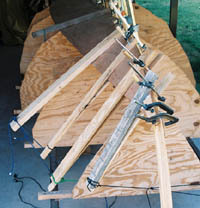 Sheet metal screws and fender washers hold planks against the backbone between stations. 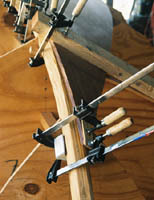 Clamps can be used in the centerboard slot. Garboard #2 Attachment at the Bow A notched board temporarily attached to moulds 1 and 2 provide convenient clamping points for 2 x 4's used to apply twist in the garboard at the bow. Oughtred's Plywood Clamps Seen from Bow Oughtred's clamps worked very well! One Temporary Screw at Each Station A temporary screw at each station was set during the 'dry fit' of each plank. This simplified the later positioning of slippery glued boards. 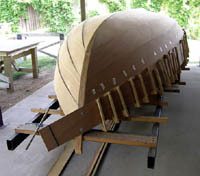 Half-Planked Hull Seen From Stern Plank ends are shown nearly planed down to the stem. Battens are in place for bevelling the plank lands. Beginning to Look Like a Boat The building frame is being pushed off of the concrete slab to free up the covered work space for another project (daytime job). Showing Her Norwegian Heritage The third pair of planks is dry fit. The weather is not cooperating, and gluing must wait. (But we are in a drought, so no one is complaining.) Would the Vikings be proud? Dry Fit of First Sheer Strake Succesive planks are easier to attach because of less twist and bend towards the sheer...and a little more experience with the process. Dry Fit of Second Sheer Strake--Last Plank! Another milestone. Closeup of Clamping Mechanism for Last Plank A Spanish windlass holds the plank end in place while temporary screws are placed. Indexed strips of masking tape, placed during the dry fit, mark clamp positions for the final gluing--when there is no time for fiddling around.